READY JET GO! 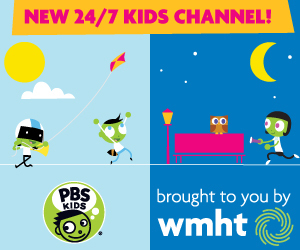 is a new PBS KIDS earth science and astronomy series for children ages 3-8. READY JET GO! takes viewers on a journey into outer space, building on children’s curiosity about science, technology and astronomy. The series follows two neighborhood kids: Sean, who has an all-consuming drive for science facts, and Sydney, who has a passion for science fiction and imagination. They both befriend the new kid on their street, Jet Propulsion, whose family members happen to be aliens from the planet Bortron 7. Together, they explore the solar system and the effects it has on the science of our planet, while learning about friendship and teamwork along the way. The series will premiere on February 16, 2016 on PBS stations nationwide (check local listings). Digital content related to the series, including games, hands-on activities and parent resources, will be available in early 2016 as well. Jet attempts to play the “Solar System” game with Sean, Sydney, and Mindy, but the kids don’t quite understand which planets go where. Celery, Jet’s mom, takes them on a tour of the solar system and introduces each of the eight planets. Curriculum: The sun is at the center of our solar system, and everything else revolves around it. The sun, planets, dwarf planets, moons, and different kinds of space rocks like asteroids and comets are all part of our solar system. Curriculum: “Failure is not the opposite of success; failure is a stepping stone to success.” This attitude can be applied to cooking as well as scientific discoveries! Curriculum: The sun is a star. Our sun is a star in the Milky Way galaxy, a yellow dwarf. The Propulsion family comes from another star in our galaxy: Bortron, a smaller, cooler red dwarf star. Curriculum: An observatory is a location used for observing terrestrial or celestial events. A telescope is an instrument that aids in the observation of remote objects by collecting electromagnetic radiation (such as visible light). Curriculum: The planets both revolve around the sun and rotate on their axis. Curriculum: There are different kinds of stars, which emit different kinds of light. Curriculum: All life on Earth comes from the energy of the Sun. The Earth happens to be located just the right distance from the Sun: not too far away, and not too close. This makes the Earth what we call a “Goldilocks planet”: not too hot, not too cold. Curriculum: The Sun creates solar power that is used for energy. Solar power is the conversion of sunlight into electricity, either directly or indirectly. Curriculum: Craters on the Moon were probably caused by asteroids hitting the surface. Curriculum: A moon habitat is a structure on the Moon that would provide the right conditions to allow humans to live on the Moon’s surface. Curriculum: The Moon changes shape depending on its position relative to the Earth and Sun. Curriculum: Star and planet gazing. Stars twinkle because of turbulence in the atmosphere of the Earth. Planets do not twinkle the way stars do. Curriculum: The first manned mission to the Moon took place on July 20, 1969, and the first two humans on the Moon were Neil Armstrong and Buzz Aldrin. The astronauts were launched from a Saturn V rocket on the Apollo 11 mission. Curriculum: Gravity is a natural phenomenon by which all physical bodies attract one another. Gravity gives weight to physical objects and causes them to fall towards the ground when dropped. Curriculum: A planetary rover is a space exploration vehicle designed to move across the surface of a planet or other celestial body. Curriculum: Force is any interaction that tends to change the motion of an object. Force can also be explained as a push or pull. Curriculum: Mars was once (4 billion years ago) a lot like Earth, with oceans, clouds and drinkable water. Something happened 3.7 billion years ago that turned Mars’ atmosphere from warm and wet to dry and cold. Curriculum: A robot is an automatic mechanical device often resembling a human or animal. Humans build robots to perform the tasks humans can’t do, but people are still in control because they give instructions to the robots. Curriculum: There is more than one moon in the Universe; in fact, there are hundreds of moons in our own Solar System. Mars has 2 moons, Phobos and Deimos, which are unusual in that they are not round like our moon, but oddly shaped, like battered potatoes. Curriculum: An exoplanet is a planet that doesn’t orbit the Earth’s sun, but instead orbits a different star in the Universe. Curriculum: The next big frontier for human space flight is Mars. We have long range plans to get humans to Mars, but still have not solved some of the challenges, like what human inhabitants will do about the lack of oxygen and water, and the extreme temperatures. Curriculum: Sound travels in waves like light or heat, but unlike them, sound travels through vibration. So, in order for sound to travel, there must be something for sound to travel through. Sound can travel through air, water, and solid objects, but not through space. Curriculum: Saturn has more than 12 rings that are made of mostly ice. The ice pieces range from microscopic to very large chunks. The rings appear to be revolving with Saturn at the same speed but it’s thought that the individual rings revolve at different speeds. Curriculum: The North Star is often used for navigation due to its constant position in our sky. It isn’t the brightest star, but unlike the other stars, it seems to remain at a fixed location in the sky. Curriculum: Mars has deeper canyons than our own Grand Canyon on Earth. The deepest canyon in our solar system exists on Mars, called Valles Marineris. Curriculum: Our sun is actually a bright star out on a spiral arm of the Milky Way Galaxy, which is made of billions of other stars, and our galaxy is just one of billions of galaxies. Curriculum: Titan is Saturn’s largest moon, and the second largest in the solar system. Titan has lots of conditions that make it similar to Earth, including an atmosphere with clouds and a golden haze, and liquid oceans. Curriculum: Earth is not the only planet with storms! Although we have big hurricanes here that typically last up to a week, Saturn is home to a hexagonal group of hurricanes locked into place around Saturn’s north pole, that may have been going on for hundreds of years. Curriculum: Enceladus is a small moon of Saturn that contains a liquid ocean underneath an outer layer of ice. It has “ice volcanoes” that shoot geyser-like jets of water vapor into space. Some of the water vapor falls back as “snow” and the rest escapes, which supplies most of the material making up Saturn’s E ring. Curriculum: Gravity is an invisible pulling power that every object has—planets, moons, stars, and YOU. Gravity pulls all objects in the universe toward one another. The bigger and heavier an object is (the more mass it has), the more gravity it has. Curriculum: The planets in our solar system can be divided into two categories -- terrestrial (inner planets) and gas (outer planets). Saturn is a gas planet that seems to have a hot solid inner core of iron and rocky material surrounded by an outer core probably composed of ammonia, methane, and water. Curriculum: An ion drive engine is a very fuel-efficient engine for space vehicles. Ion beams are capable of propelling spacecraft at up to 10 times faster than ships propelled by chemical rockets. Curriculum: Asteroids are small solar system bodies that orbit the Sun. Asteroids are similar to comets but do not have a visible coma (fuzzy outline and tail) like comets do. A meteor is a small asteroid that burns up as it passes through the Earth’s atmosphere. A meteorite is a piece of asteroid that survives falling through the Earth’s atmosphere and collides with the Earth’s surface. Curriculum: Meteorites are pieces of space rocks (asteroids) that break up when they hit the Earth’s atmosphere and fall in small pieces. Meteorites are older than any rock from Earth, and share certain characteristics: density (high), attraction to a magnet, and rust. Curriculum: A comet is an icy body that releases gas or dust. Comets are often compared to dirty snowballs. Occasionally a comet streaks through the inner solar system, creating quite a show! Curriculum: Asteroids are mostly found in the Asteroid Belt. Occasionally an asteroid can break away from the gravity of the Asteroid Belt and intersect with the orbit of the Earth. When a small asteroid enters the Earth’s atmosphere, it becomes a meteor and burns up. Curriculum: Northern lights (aka, aurora borealis) are a natural, awesome phenomenon. The origin of the aurora begins when a cloud of gas is ejected from the Sun’s surface. When it collides in Earth’s atmosphere with oxygen and nitrogen, it produces dazzling auroral light. Curriculum: The International Space Station (ISS) program is a great global human achievement in international cooperation. Countries work in partnership to support the experiments of scientists on the ISS, including observing space, growing plants in micro-gravity, and recording observations. Curriculum: It’s hard to have a picnic anywhere in the Solar System besides Earth – here we’re not too near or too far from the Sun, so the temperature is just right, plus we have liquid oceans and a breathable atmosphere. Anywhere else, you’d definitely have a hard time enjoying a picnic outdoors. Curriculum: Technology has advanced greatly since the days of the giant computers that guided man to the moon in 1969. However, even though technology is very useful, it is still a tool, not an end in itself, and people still need to know how to monitor and program it.